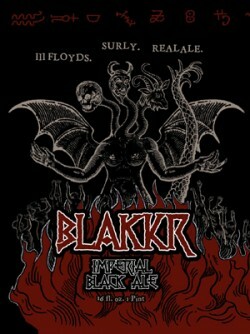 BLAKKR (an old Norse word for dark or black) is an imperial black ale brewed with Warrior, Simcoe and Centennial hops. Who turned out the lights? 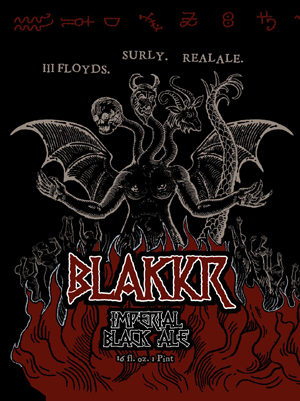 Like a black hole of flavors—pine, currants, smoke, chocolate—this collaboration beer, with label art depicting lost souls writhing in hell fire, takes a deep dive into the Black IPA style. First, it is truly black, not brown like some others. Then there is combination of hop oils and malt thickness that leaves the slightest bit of alcoholic heat on the finish. It evolves as it warms, with some citrus becoming more pronounced. This might be a one-off, but will certainly inspire other brewers of black IPA to step up their game. If you hold a high-powered light up to a glass of this beer, you can just about see some purple tones, but otherwise, yes, this is indeed blacker than your average black ale. Richer in aroma, too, with a mix of raisins and blackberries, flamed lemon zest and high-cocoa-content chocolate, licorice and prunes. On the palate, all that fruit arrives first, especially the blackberries, before it’s joined by considerable roastiness, citrusy and oniony bitterness and growing alcoholic heat, the last of which emerges more so in the bitter, drying finish. Boozy and soothing, this is one for the very end of the night, perhaps with some Spanish Cabrales cheese.